Crewe & South Cheshire Motor Club notebook. Homepage. This page: A blank notebook given away with the compliments of the C&SC MC. Crewe & South Cheshire-based motor club. 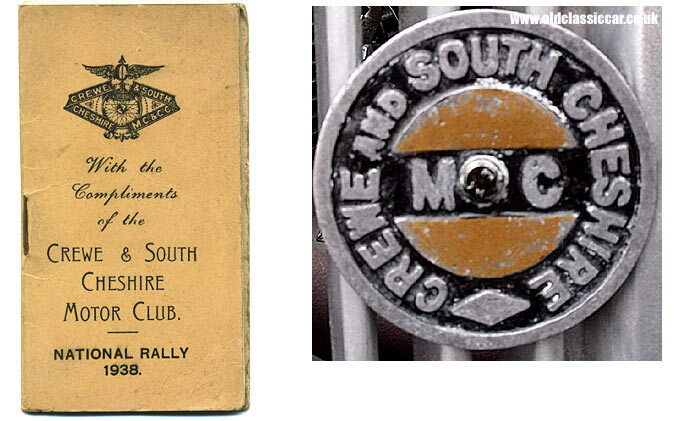 This slim notepad was given away to members of the Crewe and South Cheshire Motor Club, at their National Rally held in 1938. Perhaps unfortunately, there are no notes of interest scribbled inside it (other than someone's shopping list!). A close look at the logo reveals a motor-car or motor-cycle wheel at its centre, with the words Crewe & South Cheshire M.C. & C.C. Now, this could either stand for Motorcycle Club & Car Club, or else perhaps Motor Club & Cycle Club. Yet the car radiator badge I've included a photo of, simply refers to the M.C. rather than M.C. & C.C. All very confusing, perhaps the badge is post-war and the club had by then dropped the C.C. part? This isn't a club I'd heard of, despite being familiar with South Cheshire. Searching online brings up evidence of the club still being in operation, or at least one or two events retaining the club's name in their titles. Those event references that I have found seem to concentrate on motorcycling action, for example off-road trials, rather than car and bike activities. Hopefully someone will land on this page, and be able to provide either some further history on this club, or perhaps shed light on what they're upto today if still in existence. More items of paperwork relating to motoring in the pre-war days can be found in the Motoring Collectables section.